Before we start to examine this interesting phenomenon, we first have to make a distinction between schooling fish and shoaling fish. When fish are shoaling, they can be observed congregating in large numbers, but without a (seemingly) clear pattern or goal. A shoal can consist of a number of different species as well as different age groups and sizes. A school of fish, on the other hand, consists of fish exclusively belonging to the same species and, in most cases, more or less of the same size. A further distinction is the fact that a school of fish seems to behave like one organism, so to speak. But how and why do fish swim in schools? A school of fish appears to be a well-drilled military regiment or a choreographed dance troupe. In a remarkable fashion every individual fish seems to be able to hold its position relative to the fish next to it at a constant distance and the school will manoeuvre as if on command. Especially when trying to escape predators, fish in a school will perform near instantaneous movements which defy belief. In this article I will briefly explore the reasons how and why fish swim in schools and I will also try to give an explanation as to how they are able to achieve this amazing harmonious action using research done by experts in the field. Finally I will relate some of my experiences doing battle with two types of schooling fish. According to scientists, fish are able to perform these amazing feats through a combination of visual contact with other fish in its near vicinity as well as the use of their lateral line. The latter is a visual organ on each side of its body which is extremely susceptible to pressure changes, however small, that occurs in the near vicinity of a fish. The lateral line runs along each side of the fish from the gill covers to the base of the tail. It also detects water currents and vibrations. Depending on what its close companion does, whether speeding up or quickly turning, this will be picked up by the lateral line with an immediate response by the owner thereof. Furthermore, each fish maintains a “private zone” which keeps it protected from collisions with its mates. If a neighbour encroaches on this exclusive space, the fish will automatically turn away thereby avoiding physical contact. Outside of this zone there exists a “zone of orientation” where each fish constantly tries to emulate the other fish in its close vicinity. This action is the most pronounced when the school is moving together. First of all fish prefer to congregate in a school for protection against other predatory species. The old saying: “Safety in numbers” has never been more apt than in this instance! It is just so much more reassuring to know that you are part of a group of individuals counted in their thousands (or even millions) if some hungry nasties with sharp teeth start knocking about looking for fresh seafood. Obviously fish don’t think about it the way us humans do, but any decent statistician will be able to tell you that the odds of you being devoured dramatically drops the moment you find yourself surrounded by countless brothers, sisters, aunts, uncles, cousins etc. Therefore you will find that most fish species, although some of them may tend to become solitary in their adulthood, tend to form schools as juveniles. This is the period when they are at their most vulnerable and the statistics regarding attrition rates during this period are simply horrifying. Thus, in order to have a remote chance of reaching maturity and being able to contribute further to the gene pool of a particular species, Mother Nature thought it prudent to instill the genetic code for this specific type of behaviour in those fish species. Turning our gaze now to fish habitat we will observe that, apart from the juvenile stages, schooling seems to be more prevalent among adult marine species compared to freshwater ones. 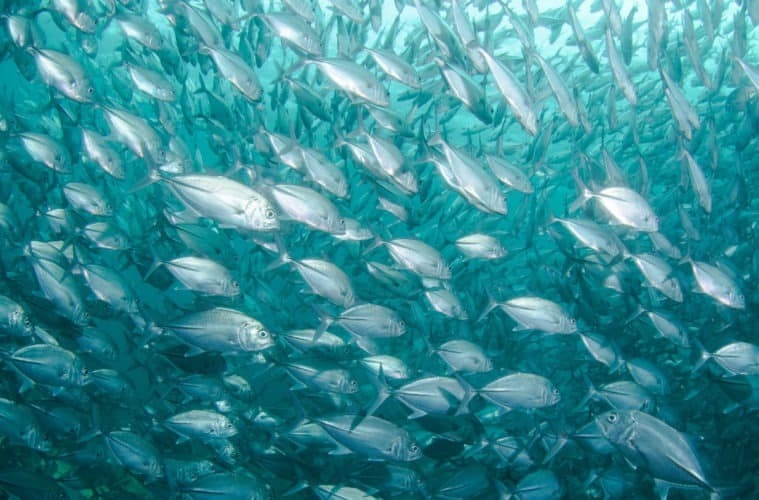 The numbers in one school of some marine species, like herring and sardines, can be quite staggering and schools of a few billion fish are not uncommon amongst them. One of nature’s true marvels is an annual migration of sardines from the West Coast of my native South Africa to the East Coast. They are a cold water species and normally the East Coast waters are not to their liking at all. But every year environmental conditions create a narrow corridor of cold water hugging the East Coast which allow billions of these little fish to move eastwards on the way to their spawning grounds. The shoals of predators, notably dolphin and sharks, not to mention predatory birds, following this nutrient bonanza make it the biggest annual gathering of predators in the world. One of the true spectacles of nature surely must be the epic journeys of various Pacific salmon species like sockeye, chinook or coho entering various river systems in the Pacific Northwest of America and Canada on their way to their spawning grounds. This seems to be a second reason why certain fish prefer to form schools. You can rest assured that those are not the only fish species to congregate in massive schools in order to enter the mating and spawning cycle of their lives. However, it is only because nature dictates that they should leave the ocean and procreate in the shallow headwaters of big rivers that we are privileged to witness this very private and arduous activity. Having said that, due to organisations like National Geographic and the BBC, nature lovers across the globe are now able to also observe similar behaviour by some deep water marine species due to the spectacular fortitude and camera work of professional scuba divers and photographers. A third reason for fish to form schools is to hunt for food. To employ sufficient numbers in executing an attack in order to outwit and outfox potential prey has been proven a very successful strategy across a range of predatory animals (humans included) since the evolutionary arms race between predator and prey species kicked off all those eons ago. Scientists have studied the behaviour of oceanic predatory species, like Atlantic Bluefin tuna, and ascertained from the evidence gathered that the tuna school forms a unique shape in order to enhance its hunting success. It seems that the swimming pattern as well of the school formation give rise to maximum visual observation of prey species. Furthermore, once a section of the school encounters prey, their feeding behaviour gets quickly telegraphed to the rest of the school who can then join the feeding bonanza. Now, allow me to tell you a bit more about my fishing experiences with two predatory schooling species namely snoek (Thyrsites atun) and bluefish or tailor (Pomatomus saltatrix). The snoek is widely distributed in the colder waters in the Southern Hemisphere. It is found from Moçâmedes in Angola to Mossel Bay in South Africa, off Tristan da Cunha in the mid southern Atlantic, off Western Australia, where it is called the barracoota and off Chile and Argentina where it is called the sierra. Bluish-black on top with a silver belly, the snoek grows to over a metre in length. My first experience with snoek fishing was during my student days when I befriended a guy whose parents owned a seaside cottage on the barren West Coast of South Africa. Every year vast schools of snoek make the annual migration from Angola to Cape Point and beyond and every year local fishermen board their little snoek boats (or “bakkies”) and do battle with this exciting and sumptuous quarry. My friend’s father owned a small boat with two outboard engines and during the Easter holidays we trekked to the West Coast to indulge in a bit of snoek fishing. The basic fishing method involves fishing with hand lines and either a hook baited with sardine or an artificial lure imitating squid. Once on the ocean one could observe, by means of a fish finder, the massive shoals of predatory fish moving about and targeting large shoals of either sardines or squid. I vividly remember looking in absolute astonishment at the screen of such a device showing an image that resembled a subterranean reef when in fact it was a vast school of snoek blackening out the whole screen. The tactic for snoek fishing is to drop the lure to the level of the schooling fish and entice them to start biting. Once they become interested, one can coax the school higher and higher through the water column until, sometimes, you could see them right under the boat, by that time in a veritable feeding frenzy and prepared to attack anything dropped in their close vicinity, sometimes even a bare hook! Moving over to blue fish the fishing scenario is a bit different. The bluefish is a marine pelagic fish found around the world in temperate and subtropical waters, except for the northern Pacific Ocean. Bluefish are known as tailor in Australia and elf or shad in South Africa. Other common names are blue, chopper, and anchoa. It is a popular gamefish as well as a food fish. I have no idea why the Aussies decided to call this fish “tailor” but I have a sneaky suspicion it has something to do with the armoury of viciously sharp teeth they are equipped with which they apply in the same manner as a tailor’s scissors – snip…snip…snip. A fishing buddy of mine used to call them “piranhas of the sea”. Bluefish attack baitfish in great numbers and their feeding frenzies are orgies of biting and slicing through their victim’s bodies leaving behind a trail of maimed, bleeding baitfish and writhing body parts which are gulped down on the subsequent waves of bluefish attacks. Fishing for bluefish from my beloved Strand reefs in the Western Cape with a light weight rod, a small spincaster reel and some metallic spoons truly came close to the ultimate in fishing thrills. Hunting over shallow reefs in water sometimes less than a metre deep, bluefish angling can be one prolonged adrenaline trip. After years of fishing and regularly witnessing schooling fish operating in their natural environment I am still amazed by their seemingly choreographed movements without any indication of a designated leader, or leader group, dictating those actions. Suffice to say that it is but one of a plethora of amazing things about nature in general and the private lives of fish in particular and the type of things that anglers are privileged to be witness of. The more time you spend outdoors the bigger the chances you will be treated by one of nature’s truly splendid shows and, in my humble opinion, few human efforts can hold a candle to these.